Jamaal Charles showed tremendous burst during Sunday's win over Oakland, when he tied a franchise record with five touchdowns. KANSAS CITY, Mo. 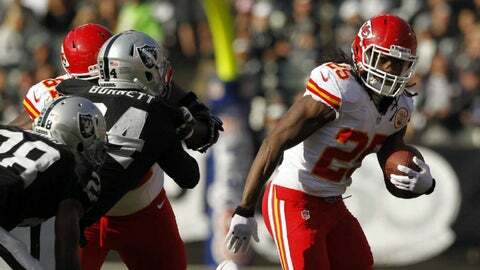 — Five things we learned from the Chiefs’ 56-31 thrashing of Oakland on Sunday. You simply can’t give enough credit to general manager John Dorsey and coach Andy Reid for turning this franchise around so rapidly. A year ago, as we all remember, Kansas City was healing from the horror of the Jovan Belcher murder-suicide and the Chiefs couldn’t wait for the season to end. Already at this time last year we were all wondering who would be the coach to replace Romeo Crennel, and we were just as sure general manager Scott Pioli would be replaced as well. Even when Dorsey and Reid arrived, the experts around the NFL suggested time and again that if the new management could just get the Chiefs to 8-8 this year, it would be a fantastic achievement. But here sit Dorsey and Reid — and they have to be the 2013 executive and coach of the year — at 11-3, having clinched a playoff spot and still hungry for more. These Chiefs are just the fourth team in NFL history to have lost 14 games one year and made the playoffs the next. The Chiefs are now tied with the Broncos atop of the AFC West, and I’m having to rethink my earlier stance on a possible division crown and a home playoff game. While it seems unlikely that Denver will lose at Houston or at Oakland, there are just too many crazy things happening in the NFL right now to completely dismiss that notion. Regardless, the Chiefs are in the playoffs, and they also are a team no one wants to face because they are three-dimensional — their offense is explosive, as are their special teams, and the defense seems to be coming out of its funk, especially in the turnover department. I remember earlier this year when some talk show hosts in Kansas City were suggesting Jamaal Charles had lost a step and he simply didn’t have that familiar burst from last year. Well, he looks pretty fast to me. And the truth is that Charles simply looks as healthy as he’s been all season and that is likely why he ran like a track star Sunday. Remember that Charles battled painful blisters on the bottom of both feet for the first half of the season. While he doesn’t like to discuss his injuries, the guess here is that those blisters have finally healed completely. There’s little doubt that Charles has had that special acceleration the past two weeks, and especially Sunday against the Raiders when he tied a franchise record with five touchdowns and also became the first running back in NFL history to have four receiving touchdowns. On each of those receiving TDs, Charles showed tremendous burst, something he might not have had earlier because of those blisters. Charles obviously was in on a ton of big plays Sunday, but really the biggest came in the third quarter after the Raiders rattled off 21 unanswered points and pulled within 35-31. This is the time in games when veterans have to step up and make plays. Facing a third-and-1 the next time the Chiefs got the ball, quarterback Alex Smith, who was brilliant all day, went play-action and found Charles uncovered near the sideline. Charles took it from there and finished off a 71-yard receiving touchdown. If Smith doesn’t connect on that pass, the Chiefs punt, and then who knows what the Raiders do with even more momentum? But the Raiders, being the Raiders, fumbled the ensuing kickoff, the Chiefs scored again, and … ballgame. Last year when safety Eric Berry was voted to the Pro Bowl, there was snickering and a little bit of disbelief among some Chiefs fans and observers. To many, it didn’t seem like Berry had had a Pro Bowl season in 2013. Well, how do you feel about Berry this year? Berry had another phenomenal game Sunday with two picks, one of those a pick-six, his second of the season. Berry is second on the team this season in tackles with 66 and also has 3 1/2 sacks. Berry almost surely is headed back to the Pro Bowl, and deservedly so. Just kidding. But hey, Justin Houston’s replacement, Frank Zombo, had a pretty decent game Sunday, notching a team-high seven tackles to go with an interception. Zombo still struggles in pass defense too much, often forced into trail technique because of his lack of speed. But he has heart and he’s not afraid to lower his shoulder to make sound tackles. And he’s gaining valuable playing time while Houston heals. You can follow Jeffrey Flanagan on Twitter (@jflanagankc) or email him at jeffreyflanagan6@gmail.com.